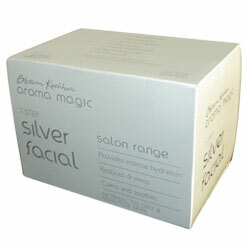 Aroma Magic Silver Facial Kit Intense Hydration, Reduce Dryness, Calm & Soothe, For Normal To Dry & Sensitive Skin. Silver Facial Kit From Blossom Kochhar Aroma Magic Online Shop. This facial provides optimum moisture and intense nourishment to skin. For normal to dry, and sensitive skin. Cleanses, lightens and brightens skin with grapefruit, lemon and aloe vera extracts. Tightens pores with vitamin C and beta carotene. Mattifies and revitalises your skin with the blend of palmarosa and neroli essential oils. Aqua, decyl glucoside, cocamidopropyl betaine, olive esters, cymbopogan martinii oil, aloe barbadensis leaf extract, grandis seed extract, citrus medica limonum extract, fruit derived beta carotene and citrus aurantinum oil. Clean face with sachet no. 1 for 3 minutes. Wipe off with damp cotton. The natural enzymes help to remove black and white heads, brown spots and sebum deposits. An antidote for acne and oily skin. Extracts of Apple, Lemon, Lactic and Malic Acid and pure essential Oils of Rose and Lavender. Make a paste of sachet no. 2 and 3. Apply all over the face and neck and leave it on for 15 minutes. Massage gently with damp fingers for 3 minutes. Wipe off with damp cotton. Rich in lactic acid. Leaves your skin shades lighter, more velvety and luminous. Dried Yoghurt, Soya Protein, Hydrolyzed Protein, Vitamin A, C, E & Minerals. Make a paste of sachet nos. 2 and 3. Apply all over face and neck. Leave it on for 15 minutes. Massage gently for 3 minutes with damp fingers. Wipe off with damp cotton. Gives extra protection and moisture to dry and delicate skin. Promotes skin hydration and liposomes transport water into deeper skin layers. Extracts of Aloe Vera, Sandalwood, Wheatgerm and Pure Essential Oils of Rose, Geranium and Chamomile. Tissue dry the skin and apply sachet no 4 all over the face and neck. Leave it on for 3 minutes to allow absorption. Helps to balance and moisturise dry skin and bring glow to the face. Extracts of Aloe Vera, Elder Flower, Vitamin A and Pure Essential Oils of Neroli, Lavender and Geranium. Apply a layer of sachet no.5 all over face and neck and give Galvanic(+) current for 3 minutes. Revitalises and hydrates the skin complexion. Reduces irritation, sensitivity and protects skin from damage due to external environment, central heating and air conditioning. Enhance skin radiance, leaves skin fresh and dewy. Extracts of Seaweed, Lotus, Flax Seed, Aloe Vera and Pure Essential Oil of Neroli. Without wiping off, take sachet no.6 and massage all over face and neck, including eye area for 15 minutes. Wipe off. An AHA pack that balances uneven skin tone, lightens and brightens the skin. Regenerates cellular tissues and slows down skin ageing process to reveal a healthier, lighter and radiant looking skin. Organic Fruit Acid, Extracts of Orange Peel, Clove, Organic Fruit Extract, Pure Essential Oils of Neroli, Orange, Petitgrain. Apply a layer of sachet no.7 all over face and neck, avoiding the eye area. Leave it on for 15 minutes and wipe off. Apply sunscreen to ensure protection.